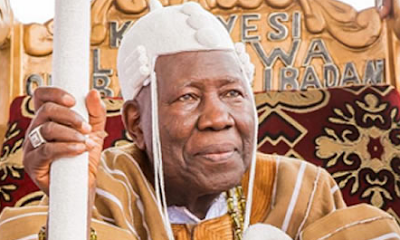 The Olubadan of Ibadan land, Oba Saliu Akanmu Adetunji, Aje Ogungunniso 1 Tuesday described the purported threat of 21 new Ibadan kings to recommend him for removal as an affront to the people of Ibadan. The traditional ruler also referred to the 21 kings as entertainers of the year even as he declared that they (21 new kings) lacked the powers to unseat the Olubadan. In a press release issued, signed and made available to The Nation Tuesday by the Director, Media and Public Affairs to the Olubadan , Mr Adeola Oloko , Oba Adetunji stated that ‘the so-called Oba-in-Council ‘ was unknown to the Oyo State Chieftaincy Laws, and wondered how a group of educated individuals such as the embattled high chiefs could resort to illegality by commenting on a matter before the court. Hearing continues Wednesday 13 December at the Oyo State High Court, Ibadan in a suit filed by the Olubadan against the Oyo State Government on the controversial chieftaincy review. Oba Adetunji who has pleaded with the court to take judicious notice of the persistent contempt of court on the matter before it by the defendants in recent times, is of the opinion that if a scape goat is not made of at least one or two culprits, there may be no end to court contempt. On the issue raised by the Oba-in-Council; Olubadan contended that the council in question which comprises high chiefs and Olubadan only is basically an advisory council with no force of law, customs and traditions backing it. ” In the same vein, Baale whom the embattled high chiefs have added to themselves to become 21 are not members of Olubadan-in-Council and therefore should not be dressed in borrowed robe, as they have no power whatsoever over their lord, ” the frontline Oba said. According to Oba Adetunji, as the prescribed and appointing authority , he can promote and/or peg the promotion of an high chief as long as he wishes . But he added that he did not contemplate any such decision as he does not see himself as an absolute monarch. Oba Adetunji contended further that there was no time that the embattled high chiefs were barred from attending palace activities, adding that they were the ones who spurned palace invitation in their desperate rush for multiple crowns and cheap royalties. He expressed delight that despite their absence from official palace activities, the Olubadan had been exercising his duties without let or hindrance. The Olubadan stated that even when they were being harassed and molested in the city streets and called unprintable names, he has been trying his level best to calm down frayed nerves in order to guarantee their safety and security by going to court to diffuse tension. Oba Adetunji stated that as the Yoruba proverb says that okro can never outgrow its reaper, an high chief can’t outgrow the king by threatening to recommend him for removal. “By custom and tradition, no Olubadan has been recommended for removal from office by any high chief or group of high chiefs at any time and my own reign will not be an exception. At least, we have received applications from families of about four of the embattled high chiefs asking for their immediate replacement. But, like a prodigal son, we hope that they would sooner than later renounce the unrecognized crowns and return to the warm embrace of their father as the palace door is perpetually open. The high chiefs are hereby advised to emulate high chiefs in other places, who are not wearing crowns but still earn respect of their people for peace and progress to reign supreme in the land, ” he said. He , however , urged the high chiefs not to exercise fears yet, as their seats would not be declared vacant in the absence of court verdict.